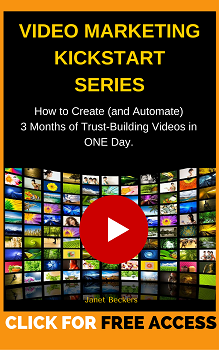 This week’s topic: “The Video Mistake of Selling At The Wrong Time”. Hey there, pussycats. Janet Beckers here with your Cool Cats Video tip of the week. Today, I’m looking at the one of the big mistakes that I see people make in their videos, and it comes down to the question of when do you sell and when do you not sell. Let’s have a look at that so that you’re going to get it right. One of the biggest mistakes I see people make when they’re putting out a regular video that is there is a way of connecting with their clients, and we’re talking here about your short, sweet videos that you’re putting out regularly and hoping that people are going to be sharing and connecting with. That’s fine, but don’t start going into all the details about why they should buy it. You’re going to lose trust. Where it comes here is much of the trust in that video, when you’re next videos come out, if you’re doing this too often, people are going to say, “Look, I’m not going to watch the videos. They’re just sales pitches.” Keep that in mind. There are times to sell, and they’re are times not to sell. Your regular content gift video is definitely there as a gift and a way of building trust, so don’t blow it. I see this mistake all the time because people are desperate to get people to buy. Don’t focus on that because people will be able to tell. I hope that helps you. I’ll be really curious, what do you think? Are you thinking, “Come on, when do I sell or how does it work?” What’s your experience when you’re watching other videos that people send out? How do you react to a sales pitch in a video that’s being offered as a gift? I’m really curious to see what you think. You might be okay with it. Please leave your comments down below. If you’d like some help, best place to start is with our video, Leverage Checklist, and that’s going to show you when you do create your videos how you’re then going to make the most of that time that you’ve spent on making a short video so that you can leverage it in 33 different ways and just get it out there online. That’s my gift to you. There’ll be links down below for that. Otherwise, I’m looking forward to talking to you down below. Bye bye.